GM employs about 2,500 union staff in Oshawa, which produces both the Chevrolet Impala and Cadillac XTS sedans. DETROIT -- General Motors said it plans to close its Oshawa, Ont., assembly plant and four U.S. factories while slashing salaried jobs and overhauling its global operations. The automaker on Monday said Oshawa Assembly, Lordstown Assembly in Ohio and Detroit-Hamtramck Assembly in Michigan will not be allocated any products beginning in 2019. Propulsion plants in Maryland and Michigan also will not be given any product. Not allocating product doesn’t mean the plants will close, but it puts their future and the jobs of roughly 6,300 hourly and salaried factory employees – 3,300 in the U.S. and 3,000 in Canada – at risk heading into contract negotiations with the UAW in 2019 and Unifor in 2020. Oshawa, GM said, is slated for closure. Unifor President Jerry Dias said he has been told the opposite, saying he’s heard that Lordstown will be down in March, followed by Hamtramck in May and that Oshawa only doesn’t have product slated for it beyond 2019. “But if you don’t have a product beyond 2019, you have to close it,” Dias said. GM, according to its contract with Unifor, must give official notice a year ahead of a plant closure. That has not yet happened, however is expected to occur. Dias promised “one hell of a fight here in Canada with General Motors,” and said that workers walked out of the plant this morning in advance of GM’s announcement. 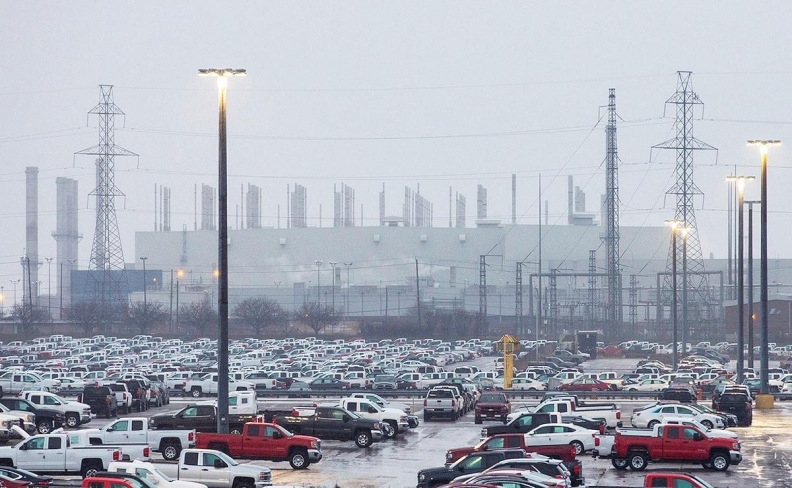 All of the products currently assembled at those three plants – Buick LaCrosse, Cadillac CT6, Cadillac XTS, Chevrolet Impala, Chevrolet Cruze and Chevrolet Volt – are expected to stop being produced for the U.S. market by the end of 2019. GM also announced it will close two unidentified assembly plants outside of North America by the end of next year and restructure its salaried workforce. The automaker expects the announced actions to annually contribute to $6 billion (all figures USD) in cash savings by 2020 — $4.5 billion in cost reductions and $1.5 billion in lower capital expenditures. Oshawa has two assembly lines. The flex line produces the low-volume Cadillac XTS and Chevrolet Impala while the truck line produces the light- and heavy-duty Chevrolet Silverado and GMC Sierra pickups. It employs 1,542 employees, including 1,348 hourly union workers. The Oshawa decision is the latest body-blow to a Canadian auto industry that has struggled to retain jobs and plants this century as automakers instead invest heavily in cheaper locations in Mexico and the southern United States. Should the Oshawa plant close, GM will be down to just one assembly plant in Canada, its CAMI factory in Ingersoll, Ont. GM threatened to close that plant last year during contract negotiations with Unifor before the two sides agreed to a new labour deal. Auto manufacturing in Oshawa, about 60 kilometres east of Toronto, dates back to 1907, when McLaughlin began building vehicles based off of Buicks sold in the United States. McLaughlin would be bought by GM in 1918, and a host of iconic GM vehicles have been built in the city since then. Auto manufacturing in Oshawa has been on the decline in recent decades. Ten years ago, the city was home to two GM plants, one for car assembly and the other for truck assembly. But the truck plant closed in 2009 during the depths of the Great Recession as the automaker was working its way out of bankruptcy, and the former car plant, now Oshawa Assembly, appears set to join it soon. Speaking on Monday, Dias called the Oshawa decision the “ultimate betrayal.” He said he was only told of GM’s decision to not allocate product to Oshawa beyond 2019 on late Sunday afternoon, after he had already began receiving calls from reporters inquiring about the news. He said he was set to meet with GM executives, including GM Canada President Travis Hester, in the afternoon. The salaried workforce restructuring includes cutting 15 per cent of its 54,000 salaried employees in North America — more than 8,000 — including slashing global executives by 25 per cent. Included in the salaried reduction is a recent buyout offering to 18,000 salaried employees that ended last week. GM declined to say how many employees accepted the voluntary offer. It was expected that GM needed to address underutilization of its plants. GM represents 1 million of the 3.2 million units of underutilized capacity in the U.S. through October, according to the Center for Automotive Research in Ann Arbor, Michigan. The impending round of cost cuts follows measures taken in 2015-18, when GM targeted $6.5 billion in reductions, including restructuring unprofitable markets such as Europe and South Korea. Detroit-Hamtramck currently builds the Chevrolet Volt, Chevrolet Impala, Buick LaCrosse, Cadillac CT6. U.S. sales of the Impala were down 13 per cent through September. Lordstown, which has dropped from three shifts to one in recent years, exclusively produces the Chevrolet Cruze. Sales of the compact car were down 27 per cent through September, GM said. It’s unknown at this time how many plant employees will be cut, as some could retire or be offered positions at other plants.